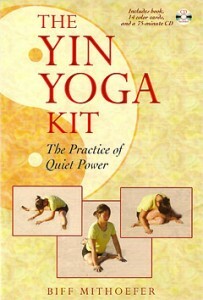 The Yin Yoga Kit is an introduction to the practice of Yin Yoga. 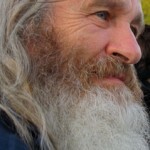 It is intended to help practitioners design a Yin practice that works best for them. It is also a helpful tool for teachers in sequencing their classes. 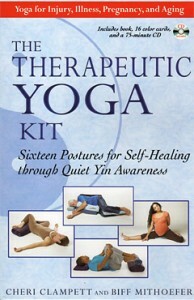 The 130-page book included in the Kit presents information about the principles of Yin Yoga. It looks at Taoist philosophy and anatomy and how they relate to the practice. It presents 14 poses used in Yin Yoga and explains each posture’s benefits, including which chakras and meridians may be most positively affected. The individual posture cards included illustrate the poses, provide advanced and modified variations, and assist users in designing a personalized practice sequence. ​The 75-minute CD contains a sample guided routine narrated by the author, with each pose presented on a separate track so listeners can rearrange them or shorten the routine as needed. “Chinese Yoga is Indian Qigong” is written and stated by many scholars and practitioners. In the summers the routes of communication between China and India are open. Yoga and Qigong are much more alike than different. Yin Yoga is a remarkable and intriguing reflection of this. This book is like a bridge between Qigong and Yoga, China and India, Qi and Prana. It is like a mountain trail between China and India, probably through Tibet.” “Love it!! I think this is going to be a very successful book with a long history in the back-list.”–Roger Jahnke, OMD, Director, The Institute of Integral Qigong and Tai_Chi (IIQTC), author, The Healer Within (1999) and The Healing Promise of Qi (2002). A therapeutic yin practice that activates the body’s self-healing potential through total relaxation and stillness. ​Each pose represents a gentle, adapted posture that is held for 10 minutes or more in a fully supported state. The authors also include transitional yoga movements and stretches to perform during the routine to release stiffness, rejuvenate the muscles, and lubricate the joints. ​Therapeutic Yoga is a blend of Restorative Yoga, gentle yoga, breathwork, and meditation that releases the body from the fight-or-flight response caused by traumatic events and life’s everyday stresses. A yin practice encourages the attitude of acceptance and helps us leave behind our yang need for constant striving and action. The 16 posture cards and 75-minute audio CD of guided routines and meditations that accompany the text facilitate the creation of a personalized practice. The authors emphasize achieving total relaxation in the specific postures to activate the body’s self-healing abilities. It is in this place of comfort and stillness where true healing begins.